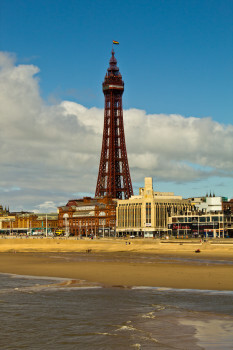 Having been to Manchester we headed further into the north-west, to the seaside resort of Blackpool. It’s a simple train journey from one to the other (though not in the greatest of trains) and saved dealing with the increased prices of Manchester accommodation. Of course, having had sun for most of the time in the notoriously wet larger city, we arrived to rain. We headed straight down the road towards the hotel but the rain forced us into the pub along the way. Though it was scarily local it was at least dry and allowed us to wait until check in time was well and truly reached, and the hotel wasn’t much further down the road. It was still incessantly raining but that didn’t deter us—we were by the seaside and going to go for a walk along the shore! We made it as far along as The Albert and the Lion (named for a lovely little humorous monologue) before seeking shelter and dinner. When we emerged it was still raining, to put it mildly. Rain by the sea is so often cold and heavy and this certainly was. We struggled valiantly further along the coast though, calling first at (very empty) Manchester and finally all the way to the Dutton Arms. 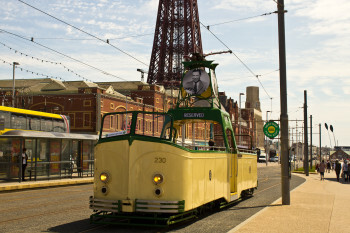 We certainly didn’t fancy the walk back in the still heavy rain afterwards so got our first experience of Blackpool’s modern tram service along the seafront, back to just across the road from the hotel. The weather the next morning wasn’t immediately promising but it was clearing up quickly as we explored the north pier (Blackpool is slightly greedy in having three piers). 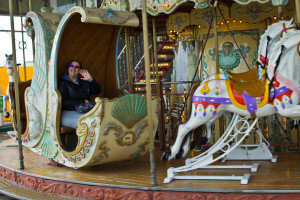 There Heather was pleased to find a double deck carousel, which she of course had to ride—while I stood and watched. She did however convince me to ride the little road train back up to the land end of the pier. 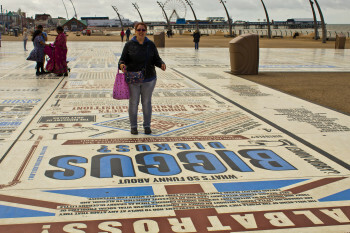 From there it’s a short stroll along the seafront to Blackpool’s most famous landmark but before heading for that we explored the comedy carpet. 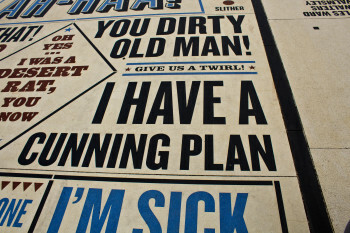 Unveiled in 2011 the carpet consists of granite lettering, ranging in size from huge to small, set in concrete blocks and spelling out catchphrases and the like from a huge range of comedy. It sits immediately across the road and tramway from the tower, visible from ground level and the elevated landmark. Around the edge runs a list of comedian’s names, most of whom have appeared in Blackpool. It was fun wandering the edge to pick out our favourite comedians, as well as walking across the many instantly recognisable phrases. Of course there is a large Monty Python section, and we ended up standing singing our way through the whole of Always Look On The Bright Side Of Life, not that I’m sure we needed the words written down for that! Other highlights included Blackadder, and Tommy Cooper, and Red Dwarf, and a quote from an episode of One Foot In The Grave we’d only watched a couple of nights before. There were many more, so wandering the carpet took more time than we’d expected. Eventually we were done, though, and so crossed the road to head up the tower. 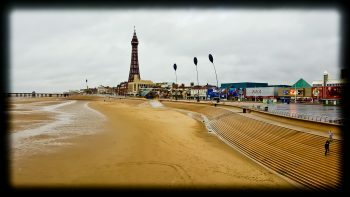 The Blackpool Tower is the most famous aspect of Blackpool, still towering over the town as it has since the late nineteenth century. Thankfully by this point the Sun was fully shining, even if the winds were still high, so we anticipated good views from the top. Unfortunately we first had to sit (well, stand) through a silly “4D” experience, which consisted of some silly swooping footage showing while water intermittently sprayed at us. I put headphones in and tried to ignore it all until they let us to the lifts. The views once at the top are worth the silliness below. Panoramic views along the seafront and out across the surrounding countryside (and to sea, I suppose) draw the eye. 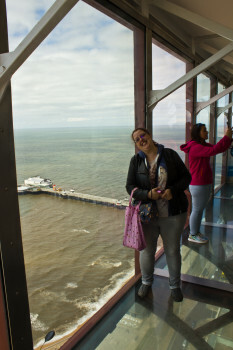 There’s a glass floor around the edge of the main viewing platform—everyone there at the time seemed easily brave enough to trust its rigidity to walk across and enjoy the view down. As the weather had turned fine the higher, open air platforms were also open, allowing us to climb to the very corner of the tower (a shame the safety caging basically severely restricts the view from there though, and it was almost too windy to look out anyway). We escaped back down the lift just in time to avoid the school group coming up! After the high of the tower we walked further along the seafront, taking in the traditional arcades (two-penny shove machines!). 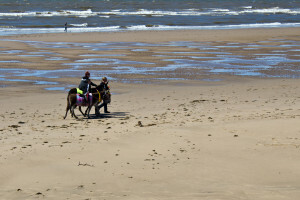 Along the way to the Central Pier we saw that most British of seaside institutions—donkey rides (Heather has never done that, and is probably a bit big to now, but I know I did, somewhere, when little). The central pier has a ferris wheel on it but that didn’t seem as attractive after the views from the tower, particularly given it was still quite windy. We moved on from the central pier for a walk along the beach. It was pleasant to just stroll along in the sun, Heather of course going for a plodge in the sea. It’s actually quite a long way along the beach at this point, so we eventually gave up with the aim of reaching the south pier and headed back to the Dutton Arms for a rest. We did eventually make it as far as the South Pier afterwards, and along beside the Pleasure Beach (not really our cup of tea), but it was a bit late and everything was more or less shutting up. So it was another tram back along to the hotel again. I left Heather there while (after a brief search for a postbox before finding the one immediatly by the hotel) I crossed the road to The Counting House to watch England failing in Euro 2016 before calling it a night. 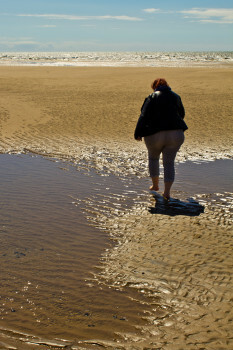 The next morning brought actual summer, as the temperature rose beneath clear blue skies. 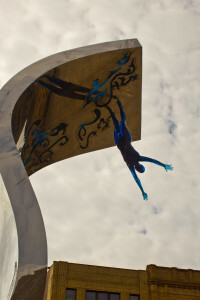 We started with a wander round to the Winter Gardens, a strange, gravity defying sculpture standing nearby. The gardens themselves are quiet but seem to lack a bit of purpose if not attending the ballroom or other space (and seem to be undergoing something of a renovation). Coming through brought us back down to the shore and some pebbles writ large as benches by the lifeboat house. From there we took a tram southward for once, heading to the pier we hadn’t had a chance to properly explore. 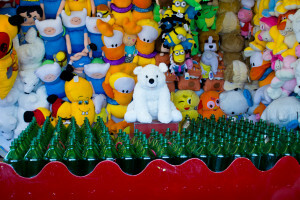 That bear had a good night! On arrival it was still a little early for things to have opened up so we took the opportunity to sit on the open roof deck of the pub opposite. After a drink we managed to tear ourselves away from the sun relaxed view back to the pier, which was languidly opening. Heather got to go on a hook-a-duck, the England lion she won having to be named Wallace of course. She also managed to convince a shop owner to briefly open up just for her! The bar on the pier afforded a final chance to sit in the sun and enjoy the view. We really were running out of time though, and so reluctantly had to head back by one last tram ride. There was just enough of the day left to look at a vintage tram parked up on display before we had to collect our bags from the hotel and head home. The post Rocking Up To The Tower was first published on Tuesday 5th July 2016 at 6:37 pm .